This is my puppy Athena, she is 14 weeks old and a wonderful handful. She is still in the puppy mouthing/biting stage and nothing is safe. :) But she is such a blessing to me and my family. Hey there, Stacy. It is good to hear from you all the way down in Lake City, Florida. Thanks so much for taking the time to come by out site here and sharing your German Shepherd puppy stories with us all today. Love the picture too - she looks so comfortable just hanging out! And I love the ears! If she grows into them, she'll big a big girl. Hope that helps. Just get yourself, and your German Shepherd puppy Athena, loads of chew toys to keep her busy and not chewing on "the good stuff" and work with her training wise too and that will be a big help in overcoming the teething process. And don't be surprised if her her go down for a while as she teeths. It can happen but they should go back up if this happens, when she is through teething. 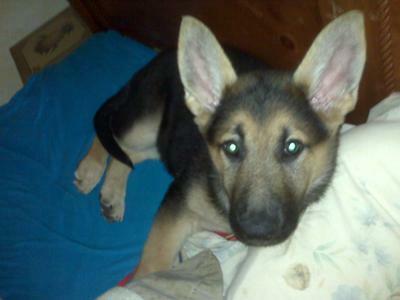 Thanks so much for stopping by with us today and reading the story about the German Shepherd puppy Athena. What a little sweet heart! I personally have had 4 German Shepherds pass on. What I say to all new GSD puppy caretakers is love them everyday. Cherish the time you have together for their time is shorter tan ours. when they are gone--they are gone! Love this puppy with all your heart and protect him/her now as a puppy and protect him/her as they become adults. You don't own this pet. You have been given the privlege of caring for one of God's children. I don't care who your God is because God is God. I'm not going to argue religion. Again, you are blessed with a beautiful GSD puppy.